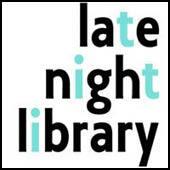 Late Night Library presents two out-of-town authors Sarah Gerkensmeyer and Claudia Zuluaga, stand-up comedian Jon Washington, live music, and prize gifts from local sponsors. Suggested Donation: $5. Sarah Gerkensmeyer’s story collection, What You Are Now Enjoying, was selected by Stewart O’Nan as winner of the 2012 Autumn House Press Fiction Prize and was longlisted for the Frank O’Connor International Short Story Award. She received her MFA in fiction from Cornell University and now teaches creative writing at State University of New York at Fredonia. Claudia Zuluaga’s debut novel, Fort Starlight, was recently published by Engine Books. She has an MFA from Sarah Lawrence College and has been nominated for the Pushcart Prize and Best American Short Stories. Claudia is a fulltime Lecturer in the English Department at John Jay College of Criminal Justice (CUNY) in New York City.